Maximum Power Point Tracking (MPPT) charge controllers serve both the solar panel and the battery by acting as a buffer between them. The MPPT charge controller recognizes the solar panel and the battery as individual circuits with completely different characteristics. When MPPT controllers are used in a solar panel system, they allow panels to operate at their rated voltage instead of the battery’s voltage, resulting in a 10 to 30% increase (average increase based on the battery’s state of charge and solar panel operating temperature) in power to the battery bank when compared to using less efficient charge controllers such as series or shunt-type controllers. Whenever power is converted from one form to another, power in the circuit is consumed to perform the conversion. The efficiency of the charge controller in processing this power varies depending on the manufacturer of the charge controller and the type. For the purposes of this discussion and for demonstration purposes only, we will assume that the circuit is 100% efficient, but the reader should be aware that the actual efficiencies are between 70 and 96%, depending on the controller. 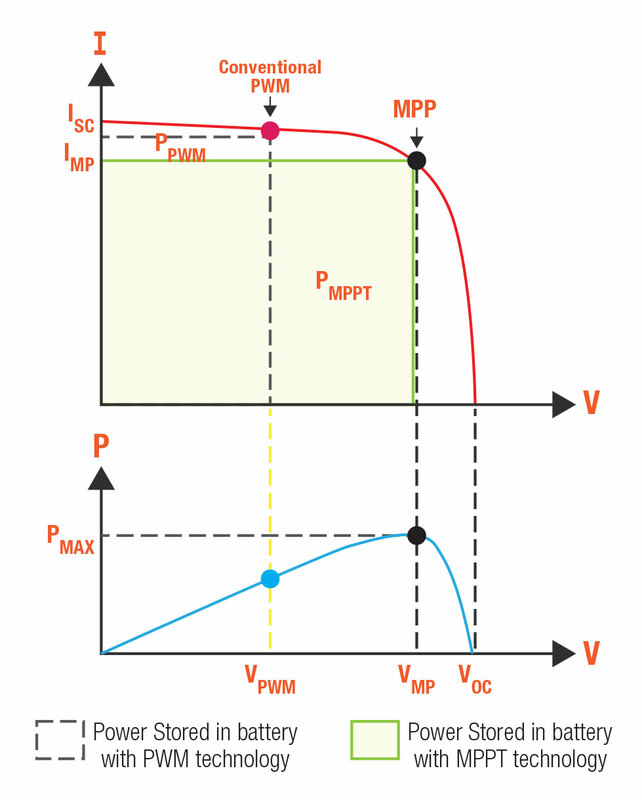 To understand how MPPT works, let’s first consider the operation of a conventional (non-MPPT, such as a series or shunt-type) charge controller. When a conventional controller is used to process solar power for charging a battery, it simply connects the modules directly to the battery. This forces the modules to operate at battery voltage, which is typically not the ideal operating voltage at which the modules are able to produce their maximum power. These simple charge controllers stop charging a battery when a certain voltage level is reached and reinitiate charging when the battery voltage drops back below that level. The MPPT charge controller calculates the voltage at which the solar module is able to produce maximum power and automatically adjusts the charging amperage in accordance with the battery’s state of charge (SOC). This allows the solar panels to operate at their rated power output and provide maximum charge current into the battery. Solar Stik uses MPPT technology in its 24VDC Power Hub 2400 and all Power Paks. The Power Hub serves as a singular collection point for multiple DC power sources including large portable solar arrays, wind turbines, fuel cells, and more. It can accept up to 2.4 kWh of power generation inputs and is a fully automated system with remote monitoring capabilities. A standard 12 V Solar Stik 200 System is equipped with two 100 W solar panels. According to the specification plate on one 100 W solar panel, it produces 5 A at 20 VDC. Therefore, two panels combined produce 10 A or 200 W of solar power at 20 V. (The panels on a 12 V Stik are connected in parallel, so the voltage remains the same.) This is a textbook example using ideal operating conditions and a non-discharged battery. Simply put, 40% of the power that is available from the panel would be wasted. In this case, the solar panels generate only 120 W of power to charge the battery even though they are rated at 200 W of output. Using MPPT in the Solar Stik System increases the performance of the charging process between the solar panel and the battery. MPPT technology allows the solar PV panel to operate at the optimum voltage where it can produce the greatest amount of power rather than at the battery’s voltage. The higher power extracted from the panel is provided to the battery as increased charge current. This is an increase in current of about 67%, which is substantially higher than the 10 to 30% increase in charging current output noted above for MPPT technology. Why? In this example, the battery’s SOC was 11 V, which for a 12-volt battery is almost completely discharged. As the battery’s SOC increases during charging, the battery’s voltage increases and the charging current decreases. Over time this will decrease the advantage of using the MPPT technology over shunt-type charge controllers, ultimately averaging to a 10 to 30% boost in charge current, not the initial 67%. However, using MPPT technology provides faster and more complete charging of the battery no matter the battery’s SOC.